Housing Out of Reach - Has it always been like this? Sometimes I wonder if the Affordability Crisis is really a recent epidemic or if it has always been difficult to buy a first home. For example did our parents and grandparents have the same obstacles when buying their first homes and are we really the generation that has been locked out? I hear the older folk say that it was not easy for them either, which I don't doubt, however, I want to explore and understand if it has become harder and if so by how much. In order to demonstrate the varying level of affordability over time, the best factor to use is the House Price to Earnings Ratio. This ratio is the most prominent method used to compare affordability and is calculated by dividing the average house price by the average gross salary. Over the last two decades the average house price has increased by 259% in England and Wales, whilst earnings only increased by 68% in the same period (ONS). This is great for those that already owned as they would have generated a small fortune through the will of the markets. But unfortunately, where there are winners, there are also losers and the changes above have made homes less affordable for the new generation of aspiring home owners. In 2016 you would need to pay on average 7.6 times your annual earnings on buying your home, whereas, in 1997 you would have paid 3.6 times your annual earning. The below graph demonstrates that affordability has become twice as bad since 1997. Was it always this bad? Are the older generation right? Has it always been this difficult to buy your first home? Simply put... No - it has got much worse. I am sure that it was tough to get the savings for their first home but the below graph demonstrates that the obstacles have become much larger over the decades. The main obstacles are saving for an initial deposit, stamp duty and legal fees and once you have done you need to demonstrate to banks that you have a high enough salary to make the mammoth monthly payments. 1970's - The turning point. My previous blogs have picked up on the importance of the 1970's when home building in the UK began to reduce. 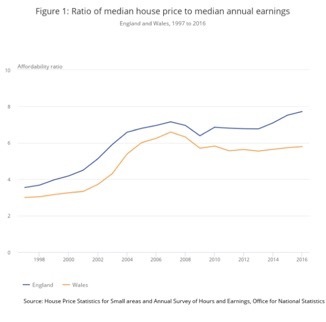 The above earning to house price graph illustrates that the increase in house prices and reduction in affordability correlate with the reduction in home building that occurred in the 1970's as illustrated in the graph below. It goes without saying that London is the least affordable area of the UK with an average house price to earning ratio of 12.05 which is one of the key reasons why so many of us are either forced to rent in the capital or move to another city or country, referred to as "Brain Drain". Why has the bubble not burst? If house prices have vastly surpassed earnings then why has the housing market not auto-corrected? Shouldn't the market regulate itself; high house prices = no sales = reduction in price? Unfortunately not. The availability of finance at 5% / 10% deposits combined with low interest rates means that people can keep buying - you may just need to rent and save for much longer than ever before! Theresa May's Government has also recently subsidised £10bn to House Builders to retain their high house prices and profit margins. You have not heard about this? It's called the Help to Buy Equity Loan. In reality it helped to boost the share price of all the top house builders. Not really - this is an artificially maintained price which is being kept on life support by the tax payer. Also, it incentivises first time buyers to stretch themselves on a 5% deposits with low interest rates. What would happen if the market actually corrects itself or if interest rates go up as they recently have? Was this not exactly what happened in the 2007 Housing Crisis!? How about instead of fuelling demand for overpriced homes, we focus on delivering more homes, support Local Authorities and SME's to build again and regulate the Private Rented market to support quality homes and tenant rights. Affordability has genuinely worsened to the current tipping point where Generation Rent has been created as a large proportion of the population are being forced into the rental market for the foreseeable. Housing is ingrained into the wealth of the UK economy and even those who own their own home are only a few pay checks away from repossession so is it surprising that the Government seems to be against a house price correction? Even a small correction in house prices would have a devastating effect on the UK economy and in our ever connected world this could lead to the next global housing crisis.